The need to write can be as essential and sustaining as any healthy addiction. With the commitment comes the inevitable desire to send the work out into the world to be published, perhaps in search of literary glory, or merely in the hope of finding corroboration that what one has written is worthwhile. Writing is such a compulsion that it justifies itself; I often find myself returning to work that is years old, which nags at me, insisting that I give it another read. The energy in the prose sustains and reasserts the imperative of its creation. Because of the number and variety of these drafts, and how they occasionally mix genres, I never know when–or if–I’ll return to them to try to revise again. At an AWP panel in Tampa this year, “How to Fail: On Abandoning a Manuscript, and Not”, the writers assembled discussed why or why not one might give up on a piece of writing. The consensus seemed to be that writers don’t easily give up on their work. This may be why William Faulkner advised us to kill our darlings—no one is going to do it for us. If success is only gauged by publication, most writers are serial failures. Yet writers who would never abandon their work seem to have hit upon a truth that lies at the heart of all writing: Only the writer herself can determine if a piece succeeds or fails. And perhaps the inherent stubbornness and persistence it takes to be a published writer means we do not give up projects so easily, or even when we should. What does one hope to accomplish with this persistent—yet intermittent—revisiting, and revising, of past work? We’re likely not just doing it for its own sake. We can perhaps see a progression in the drafts, that there is more there than we might have recognized in previous drafts; there must have been something there all along. Whatever kernels of truth there are in the work, are worth looking at again. As well, it must increase the chances of publishing if we can make use of the material we have. For myself, it often feels right to reconsider an abandoned piece, as I’m aware that I don’t usually work on something I don’t intend to try to publish. And of course, it’s not always true that what I write gets published, but I understand what it takes. It also makes me aware that writing and revision seems to never end. Though it’s possibly true that what the writer gets out of producing a piece of writing is not nearly the same as what the reader gets from it, could the need to write have any correlation to what a reader may feel drawn to in the writing? In his groundbreaking 1994 book The Gutenberg Elegies: The Fate of Reading in an Electronic Age, Sven Birkerts pairs the activity of reading and that of writing as, in essence, one and the same, of existing in a kind of symbiosis in the eye and mind of the beholder—that is, whomever is reading or writing it. Reading and writing could be the proverbial chicken or egg conundrum: which came first? In relation to other arts, writing may be no less hard won in its creation than painting, or music, or film and drama. Yet these other arts are experienced by their audience with varying degrees of passivity. It’s even possible to experience them obliviously. In fact, it would be possible to experience these works and not engage with them at all. I would guess that not everyone who seeks out cultural artifacts is fully “on” in their presence. The same cannot be said of writing. Reading is a voluntary act of volition, which requires one to fully engage with it. It is almost useless to read passively. Generally, when I read, I’m looking to be surprised, wowed, or otherwise blown away. I crave that unique experience, which occurs when a narrative is so seamlessly accomplished that it manages to defy precedent. I look for this in fiction, and most often this sustained experience is achieved in novels. Not surprisingly, it’s usually these goals that I aspire to when I write. I have the compulsion and habit of writing in multiple genres. People argue and make justifications for the superiority of one genre over another. Still, it’s all writing. Lately, I’ve been focused on poetry. Having written poetry for years, I undertook recently to study with an award-winning poet, and I’m encouraged. I read and write poetry with a sense of rediscovery, almost as if working muscles I didn’t know I had. I can sense I’m breaking ground for myself, which is an exciting part of the experiment that is my writing vocation. My interest in writing across genres—and not being defined by any one—stems from restlessness, and that genre hopping is fed by my frequently broad reading. This restlessness may also just be a way of shaking myself from complacency, keeping fresh what is in front of me. I use writing toward whatever ends my mind craves. Poetry, for me, is the purview of feeling and emotion, and playing with language. Although the same might be said of fiction, I believe fiction is driven by the play of characters. The characters of fiction become real to me, and I become their caretaker. These characters are perhaps stand-ins for my own interests, and I use them to explore motive and action. There is frequently a spiritual depth to this work. What fiction offers to a reader is story and a possibility of an empathetic identification with the characters in the work. Fiction projects a simulacrum of emotion we might feel, safely in the realm of language. We are safe because it’s only feelings we are “trying on” temporarily. We may be emotionally invested, but we are in our own heads. There are few repercussions. It can also engage the reader in the way that narrative seeks to find resolution. Narrative, which is telling a story, is inherently a form of entertainment. Nonfiction, of the type you are currently reading, is driven by a desire to clarify my thinking, or to codify an experience. Nonfiction can be intellect driven work. I find that writing in a journal, for example, is essentially the deliberative framing of my thinking. The goal is often to find the energy in a piece with the momentum of a thesis, for an essay or blog. When I write, I give myself license to not always have a clear objective. Writing is to wrestle and struggle with the unknown. To write to whatever end occurs to me is a search for the objective in the subjective. All of this is a way of trying to explain the motivation to write, the necessity of it. I can’t be sure I am providing for a reader what I look for in writing, but I hope in some way that I’m close. As much as I am a writer, I am a reader, and vice versa. It seems almost strange to say it, but I really read to learn how I can write better. How to pull off—using an imprecise expression—the tricks that I find in exemplary work that upends precedent. This is not to say I don’t also read for joy, and frisson, and to get a sense of my place in the world. But at the crux of it all is the desire—the necessity–to write, and to hopefully impart that desire to an eager reader. From the window of our Tokyo hotel, we overlook an economics college on whose balconies and roof deck congregate about a dozen students. A couple of them throw a football; some go off and stand alone on the roof to smoke cigarettes. I haven’t seen a lot of activity at the school today, compared to yesterday; it’s a Friday evening. As I scan the brick facade, in another set of windows I see a man practicing what appears to be agile karate moves. When I look again, the group is making their way down to the fifth level deck. Several in this group run around, in what appears to be an aggressive game of tag. Much good-natured yelling and hooting is going on. It doesn’t matter that this is Japan. It could be in New York City and I still wouldn’t know what those kids are doing, although I’m culturally closer to understanding the activities of a group of American college students. I’m writing this near the end of almost two weeks in Japan, and what has struck me about the country is how little I know about what I see around me. As well, how in the dark I am with the language, having picked up some while here. But as this is rudimentary, I struggle to communicate. A few observations: How are the streets so clean they look like you could eat off them–yet how can there be no trash bins to be found anywhere? Why the high-tech toilets with a control panel that looks like it requires a Ph.D. in rocket science to operate? How come I can’t find any fruit and when I do, it’s outrageously pricey? Why are there only five brands of beer (all Japanese, all lager)? Why is everyone in such a hurry to get where they are going, at any time of the day (even the Metro signs read “Don’t Rush” in English)? In the Tsukiji fish market—a warehouse about the size of three football fields–where will all that fish go? And what is the obsession with baseball, and American jazz, the latter of which is like muzak, it’s everywhere. As are vending machines. For a Californian who is making his best effort to match the symbols on the map with the ones he sees on the street signs, this is Japan. The people, I should add, are generally nice, even uncannily respectful. An old man shook my hand when I held the door open for him. Japan is a curiously orderly society. I’m reminded of what first intrigued me when I watched Chris Marker’s 1983 experimental film, Sans Soleil, which is only indirectly about Japan, but contains enough enigmas about the country to pique a writer’s curiosity. Looking out my hotel window, I feel like Jimmy Stewart in Rear Window. I get that lazy voyeuristic survey, waiting and expecting, or not, to see something, all of which would barely register in my awareness but for the fact that I am curious. So much of my writing practice is inward looking. To write is to imagine. Usually I write fiction, or I write about what I am reading. I often write on what I’m thinking about. The notes I make for myself are a few steps removed from my attempt to put them into a context where I might utilize them. I’m much less versed in the task I set for myself in Japan, writing about what is happening around me. As I want to document my trip, I attempt to catch myself in the act of noticing. This could be too obvious, perhaps to the point of self-consciousness. But on the other hand, it is not, because I lose myself in the unfamiliar, the people, their mannerisms, the general conforming of a populace to local customs. Being 5500 miles removed from my usual day to day experience, I am immersed. There’s not much practical use I have for these observations, unless of course I can apply them to a character, but it’s hard for me to see how I would extract from the general, into the particular. And to know a character, I need particulars. To inhabit an unfamiliar culture means that I can’t really know what motivates people, nor in what I’m going to find. I’m trying to do this without any Western bias of interpretation, yet the process of observation seems to get me no closer to understanding. This dovetails with a notion I have about the writing process: writing is so generated by unknowable impulses that it cannot help but enfold a mystery. And because of this, the result itself, whether fiction or nonfiction, is often an illustration of the process. On the other hand, so many writers seem to pay lip service to this notion of not knowing what it is they do—am I making the mistake of trying to demystify the process? I’m only concerned if it takes away the motivation, or places undue expectation on what I will write. The workings of writing are unconscious. If I know ahead of time what I’m going to write, why should I bother to write it? I let the mechanism work unimpeded. Writing is 99% not knowing what I’m going to write, and 1% knowing only that I’m going to write. The unknown for me—and I’d suspect, for a lot of writers—is in, what will I write? But to return to the economics college roof deck. I still have no idea what those students are doing. I have seen, and will see, before the trip is out, many more things I have no clue about, and have no basis for understanding. And so I make notes. I love the inherent mystery of not knowing. Maybe this is what keeps me writing. Maybe I never know, even after I try to convince myself of what I’m writing, what I’m writing about. This is a metaphor for my experience in Japan. It’s also a metaphor for my writing. I remind myself that the more I write, the closer I get. Writing anything worthwhile is an invitation to risk. Besides being largely subjective, risk is many faceted. Risk may be taking on the mantle of a writer, and foregoing a stable career. It can also be thought of as the effort you take to draw a reader in, or it may be what you are willing to do to your characters. Risk can also mean stretching oneself and tackling unfamiliar, outright uncomfortable, genres. But are any of these really risking all that much? In his introduction to The Best American Essays 2016, guest editor and inveterate birder Jonathan Franzen explains how the writers in the collection have risked in their essays, and that this became the basis for his selection. Franzen writes: “[…] The risk I feel most grateful to a writer for taking: shame. As Arthur Miller once said, ‘The best work that anybody ever writes is on the verge of embarrassing him, always.’ […] Your material feels too hot, too shameful, to even think about? Therefore you must write about it.” Risk is fundamental to the writing process. The writer faces potential humiliation for putting their thought into words. I occasionally feel a jolt of anxiety when I think too deeply about what thoughts I’ve put into words, though over time I’ve developed a thick skin. Once I reveal myself on the page, I try to move on. I sometimes confront the anguish of letting work get published and then finding typos, but I’m more likely to embarrass myself by failing to catch a clunker of a sentence, and then hope it goes unnoticed. I am always grateful to editors who ask about my intent before committing my words to print. Writing is a private act that one makes public, which then becomes a transaction with possibly countless unknown readers. Having an opinion and crafting an argument could be seen as hazardous, particularly if you live under a repressive government. But for many of us, it simply means we invoke the ire of those who might disagree with us. The anonymity of the internet’s comment streams seems to have made this possibility rampant; otherwise, it is foolish to be overly concerned with the reactions of trolls. There is the danger of alienating someone by writing about them in a memoir, and revealing their secrets. And there is the possibility of offending someone by your subject matter and how you deal with it. This last item is a risk that the writer takes every day. Recently, there has been a call for “trigger warnings” on some works of literature at college campuses, to warn unsuspecting readers of a potential post-traumatic stress disorder reaction. Seeing how literature has been around for hundreds of years without the equivalent of an FDA label, this notion of endangerment seems oddly concocted out of a hyper-aware desire to not offend. This political correctness on steroids subtly wants to imply that writing about an event is akin to a writer perpetrating it. A misconception about writing–often by those who aren’t writers–is that the writer exposes herself with every utterance, revealing her darkest secrets. But rarely does this occur. On the other hand, many of the essays in the Best Of American Essays 2016 have the feel of voyeuristic confessions. One essayist, Katherine E. Standefer, in the essay, “In Praise of Contempt,” writes of sexual emancipation at the hands of a man she does not like. Laura Kipnis, in “Sexual Paranoia”, details her attempts to challenge college campus harassment policies. In Richard M. Lange’s “Of Human Carnage,” the writer explores his witnessing a suicide, and an unwillingness to become further involved in the investigation. Many of the essays have clever shock value. Still, having written, published and had their work selected for the Best Of American Essays, I wonder if these writers believe they have risked in the way Franzen sees it. Perhaps our sense of risk lessens in proportion to the publicity of our work. Writing about an event in my past, I could put someone I once knew in a compromising situation, by naming them in relation to this event. This person, I could argue, might deserve the attention I give them; on the other hand, is it really my right to expose someone, even if I think they deserve it? I recently wrote a memoir about a period in college when I experienced a harrowing bout of depression. I initially felt uneasy submitting this to journals, but perhaps my piece might offer solace to someone who has gone through something similar (though maybe it would only trigger PTSD). Time and distance from the material made it easier to write the essay, but I had to consider repercussions. Though I altered names to avoid implicating some acquaintances, the story is about my own battle, and I can bear whatever outcome it entails. Writing this piece was oddly cathartic, by the way–the thrill of the risk?–though it might have been less problematic to write it as fiction. One person’s risk is another’s voyeurism, particularly if one seeks the attention. But to be a writer is to demand attention, and writing about oneself puts the writer in welcome company. Even at a reading where the audience laughs at an awkward passage possibly not intended for a laugh, at least the writer was heard (in lieu of being read). For the most part, the writing community is supportive–after all, we’ve all risked attempting to be writers. Whatever writing project you take on, it is really only yourself you are imperiling, and at that, you may be the only one who perceives the risk. Maybe the most valid claim is that, if you believe your writing is taking a risk, then it probably is. Ultimately, taking a risk in writing is what makes it worth the effort. To admit to keeping a journal might smack of a twee sensibility, but I’ve kept one for years, and find them rather to be a necessity. These journals have long given way from their original, possibly naval gazing intent, which was to chronicle the days, and have become more useful for literary digressions, and a regular and deliberate writing about writing. After the intense work of my MFA in 2006, I was writing a lot about process in my journal. While pursuing my degree I was writing in multiple directions creatively, and these experiments led to inquiries and writings on craft. Perhaps because in its normal guise this writing is known as criticism, it has a negative connotation for creative writers. But writing about writing seems to jiggle synapses, opening up my creativity. The beauty of writing about process is that the writing itself is often the process. A journal, it seems, is the perfect vehicle for exploring topics in a blog. Thus, I naturally turned to writing a blog. I’ve now written my blog for the last seven years–eleven years, if you count the one that preceded it but which I quit a few years in to go to grad school–and I’ve kept journals for much longer than that. In that time, I’ve written over 100 blog posts, most having to do with some aspect of writing and craft. Much like the critical work of my MFA, writing my blog has kept me within arm’s reach of that academic world–or at least, feeling as if I am still in the conversation. During the AWP Conference in Minneapolis this year, Charles Baxter led a panel, “The Art of the Art of Writing,” for a discussion based on his Graywolf Press series, and it was the first seminar where I found myself writing down much of what was said. As Baxter said, “Criticism is/can be, an art.” To further make this type of writing palatable, Stacey D’Erasmo, one of the panelists, offered, “Criticism is thought, not judgment.” I was also pleasantly surprised to see this wasn’t a jam packed seminar–it was late afternoon when blood sugar levels drop–which gave me solace in that it’s one area where I don’t have to feel competitive. Writing fiction, sometimes, can feel like a competition; whereas writing criticism can be an opportunity to slow down, and to ruminate. Maintaining a blog about writing is a great habit for writing fiction no less, and I can’t complain about writer’s block; I simply have to find the time to put in some writing, and invariably the ideas begin to flow. I actually don’t believe in writer’s block; Flaubert’s marinating is the occasion for me to write something different. It may at first seem an odd preoccupation for a self described fiction writer to always return to writing about writing. But as I also review books, which is another form of writing about writing, the end result is a deeper appreciation and understanding–and excitement about–the process of writing. Blog writing occupies the logical part of my brain, leaving the dreamy and surreal side to flourish for my fiction. Aware of the social network savvy-ness of blog culture, I have infrequently written a blog post hoping to garner hits. I long ago gave up trying to second guess that algorithm and instead have focused on pieces that have interested me, mainly. It’s a surprise usually to see which posts get the most hits. I would be curious to discover the site linked to my piece about short story openings–my single most read post. There’s no shortage of topics to consider, either, with the irreversible and remarkable changes in publishing over the past decade, or wide-ranging discussions of industry trends, or reviewing un-put-downable fiction. There are a number of think piece type blogs which have been resources for me, and have been models for posts I might write. The more involved with literary matters the better. (The Los Angeles Review of Books, Tim Parks’s blog at the New York Review of Books, The Smart Set, and Arts and Letters Daily are several I check regularly.) In fact, when I first began my blog, I was always surprised–and pleased–to find blogs with a similar sensibility. I couldn’t imagine this bounty if the internet didn’t exist. In reading other writer’s blogs, I have discovered a diasporic community. So I have reached out–and been reached out to–by a number of interesting bloggers, who are all fascinating to me in their unique approaches to the medium (So many have come and gone over the years, I resist naming any here). This has led to requests for guest blog postings, and one for a serial interview when I published my novel last autumn. Though I may never meet these fellow bloggers in person, it’s been great to know we are connected in a kindred medium and subject. Finally, one of the great rewards of this practice is that it has given me a log of my thinking over the years, a timeline in a body of work that parallels my creative output, since I’ve also been publishing fiction and reviews regularly when I can. 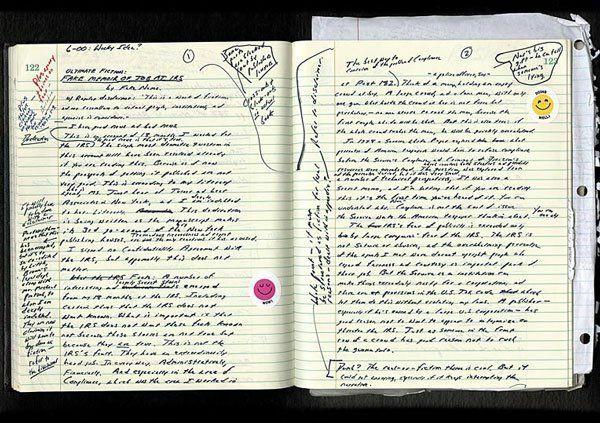 It’s surprising to look back over the years and re-read a piece I wrote about daily writing habits, or a deconstruction on David Shields’s death warrant for the novel, or an essay attempting to describe Gary Lutz’s sentences. Having become something more than the sum of its parts, I often think that my blog is a book. One day it may very well become that.